Connecting Sonos Playbar with Octava HD41ARC HDMI switch with Optical Output - Video Over IP and HDMI Video Connectivity Solutions. 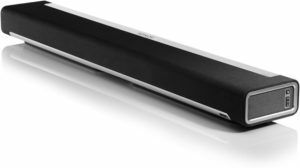 Adding HiFi sound to your high-definition TV .Try the sleek, easy to use, Sonos Playbar. PLAYBAR’s nine-speaker design delivers impeccable sound to your HD system. The Sonos Playbar plays audio from connected sources thru a single Optical Toslink Input. The Octava HD41 ARC HDMI switch is the ideal companion to the Sonos Playbar. The HD41ARC supports 4 HDMI sources and converts the connected HDMI source audio to Optical Audio output. Built in EDID Management is configured with 2Ch PCM, DD5.1 ensuring that the connected sources can output DD5.1 audio when available even if your HDTV does not supported it. Also included are 4 independent Optical inputs for those wishing to switching in only optical sources.